Sunday dawned with the breeze still there, not quite as much as the training day but still planing conditions. We all wandered down to the boats trying to figure out where we'd got all the bruises from the day before. It may have been the sailing til 6pm that we did, sunshine and breeze, you have to make the most of it! 1st race was a pursuit and with plenty of boats and windsurfers to dodge it was going to be a bit taxing. Pete Nelson shot off like a scalded cat up the first beat, leaving Matt Holden and Anthony York (Chunky) to chase each other down the first reach. Chunks managed to pick up some nice breeze down the next leg to bring him up to Pete, now it was a matter of picking your way through the toppers, solo's , etc. to get into some clear air. Pete once again pulled out on the beat with Chunks catching slightly downwind, but it wasn't enough and Pete took honours in the 1st race. The pursuit race finished with RS600's covering the top 3, we'll have to stop doing that ! Race 2, now with our own start and a confused club fleet, we set off pretty much as a mirror copy of the first race with Pete first round the windward mark, followed by Matt this time and then Chunks. Chunks managed to overhaul Matt down the first reach and had his sights on Pete, and lap 3 managed to just dip inside at a gybe mark to take the lead and win race 2. Race 3, with a change of course to triangle sausage, and with all the club boats on the line as well, it was a bit crowded. Matt was flat out planing below the whole fleet and timed it perfect to find a gap at the pin end just as the gun went, "how the hell did I do that he shouted" as he popped out of the fleet. Matt held the lead around the windward mark followed by Chunky and then Pete. Chunky managed to drop down inside Matt to take the lead around the next mark and kept extending his lead until the end, while Matt and Pete fought it out until a photo finish at the end, with Matt just pipping Pete. Race 4, and with the club fleet heading in for a break we had the rezzy to ourselves. Chunky managed to round the windward mark first and pulled out a bit of a lead only to be a reeled in by Pete on the last lap, making the last reach and beat to the finish a closely fought thing. Chunky managing to hold off Pete for the win. 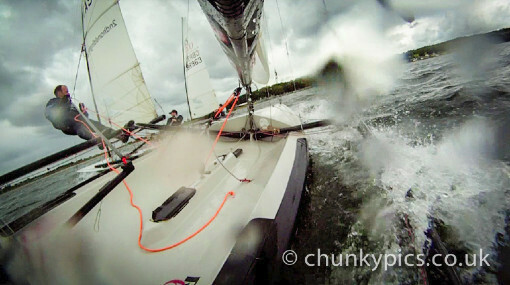 With some fantastic sailing / training on the Saturday and some very close racing on Sunday all of us enjoyed the event. Thanks to all the organisers, race officers and the club for a great weekend sailing.